Anyway, it gave me time to reflect on some recent travels, the pictures to share and stories to tell. There have been quite a few travelling ‘firsts’ in recent months. First time skiing (not something I ever imagined I’d be saying!) First time in the Camargue. First time on the south coast of France. And first time in Morocco! So. Morocco. What an incredible place. Having lived in the Middle East, I was expecting much of it to feel quite familiar, and certain aspects were, but this is Africa! Africa with an incredible mix of influences: from the Saharan Nomadic and Berber mountain tribe roots, from Mediterranean Europe and the Middle East, and from the blend of Muslim, Jewish, Christian and Hindu religions. The sights, sounds and smells of Morocco were intoxicating and left me wanting more. I will definitely go back to explore further. 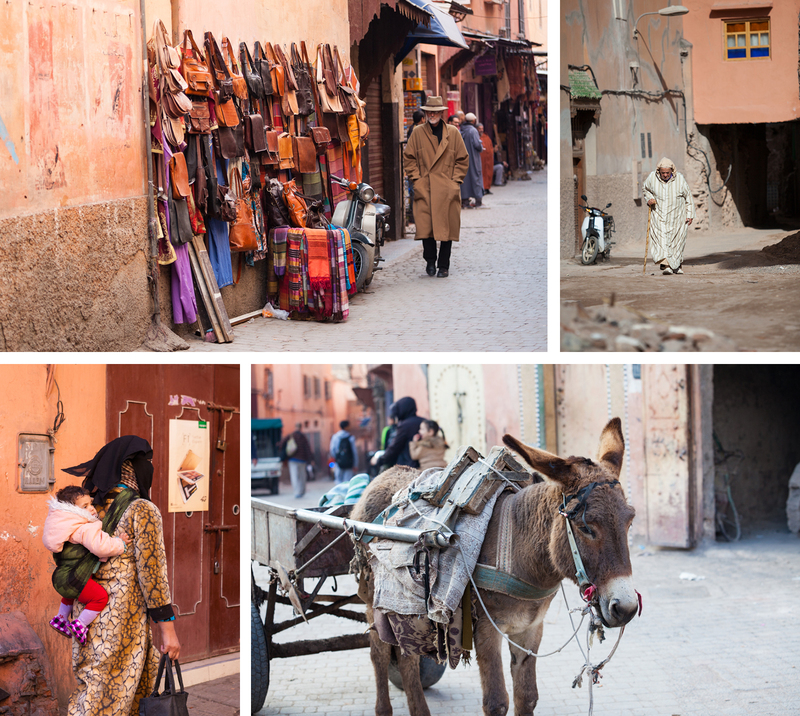 We stayed in Marrakech, taking a couple of day trips away from the city during our visit. 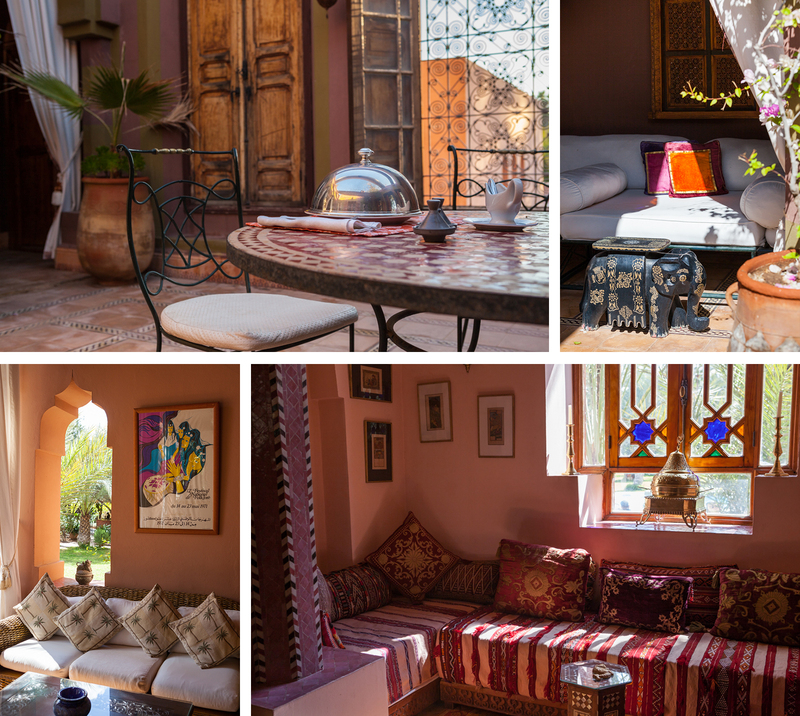 Opting to stay on the outskirts in the quieter Palmeraie district, just a 15 minute drive into the city centre, at an old villa, beautifully extended and developed as a small hotel. A peaceful haven away from the frenzy and commotion of the Medina. 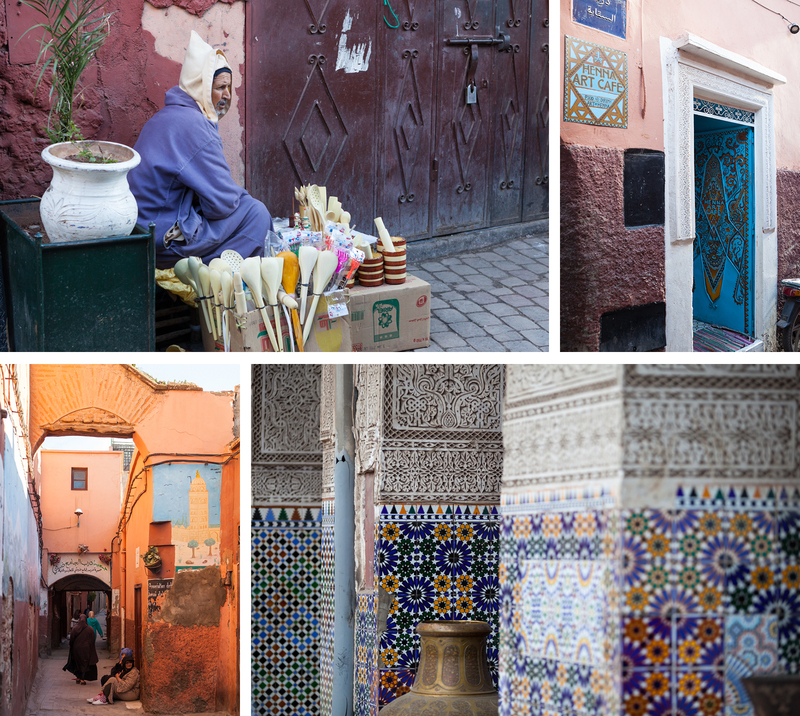 The Medina (the ancient walled centre of the city) is a must for any visitor. 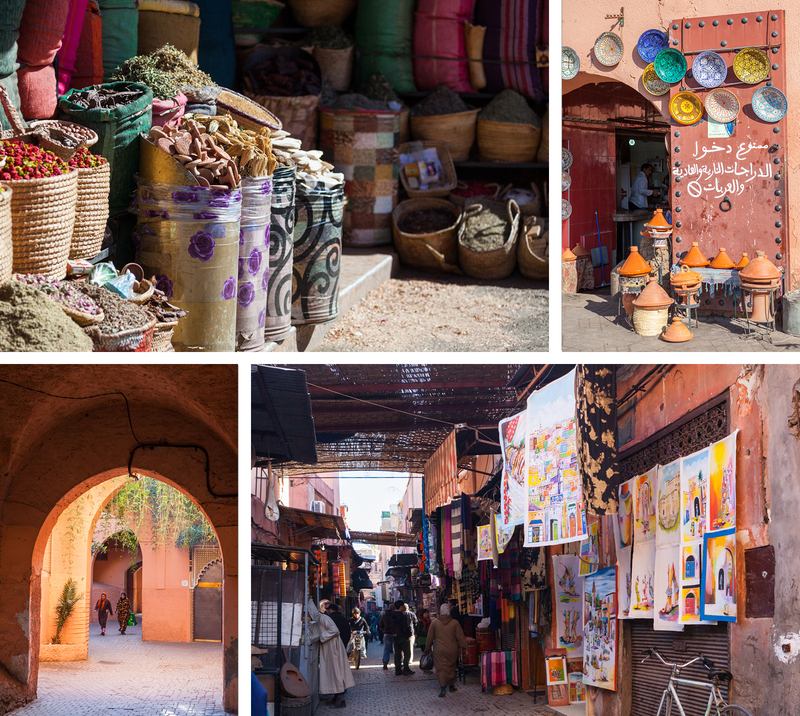 The central region of souks is a warren of streets and alleyways filled with small shops and stalls selling: spices, garments, pottery, metalwork, leather and so much more. It’s an assault on the senses and also, frankly, a bit scary when a scooter loaded with goods is whizzing by or a donkey and cart is thundering past, in alleyways that are barely wide enough for both. 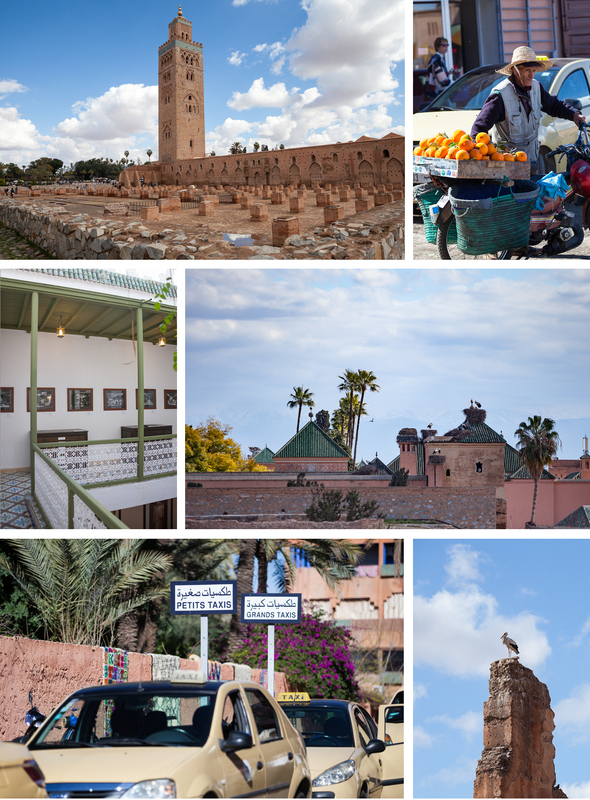 There is lots more to Marrakech than the souks: ancient palaces and architecture, wonderful exotic gardens, sites of cultural and historical significance. 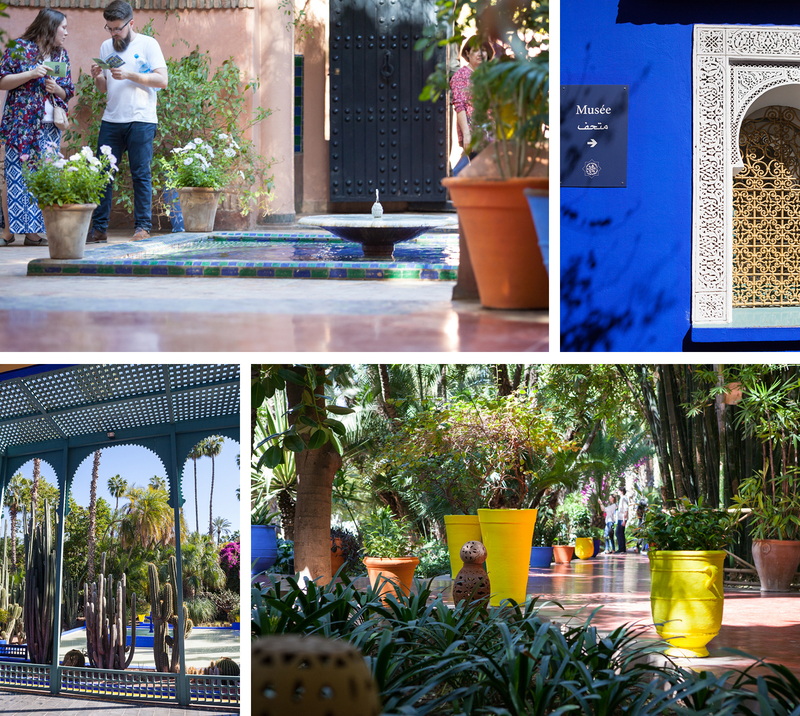 With limited time we opted for a short list of key places to visit: Jardin Majorelle, famously owned by Yves St Laurent; Koutoubia Mosque, the largest and tallest in Marrakech; El Badi Palace ruins, with the storks nesting in the ramparts; La Maison de la Photographie, housing a large collection of vintage Moroccan photographs ( and a panoramic roof terrace with views across to the Atlas Mountains). 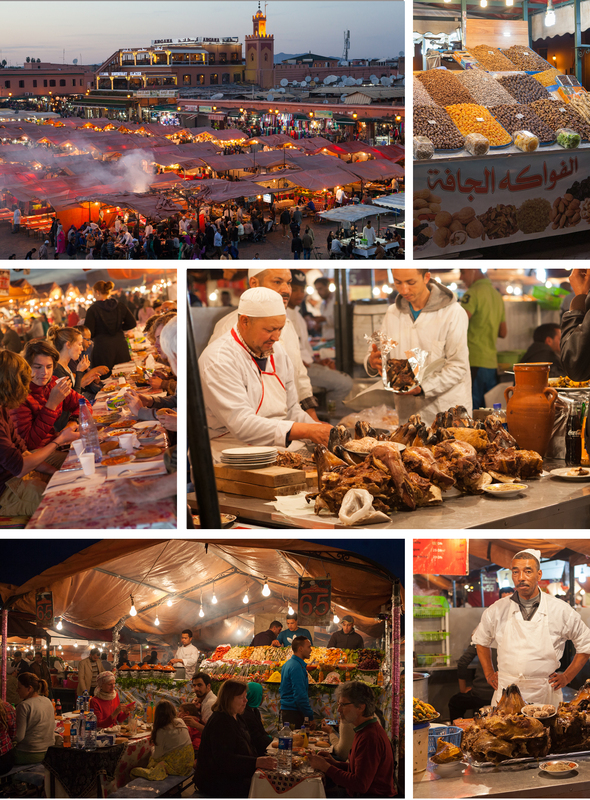 Tourists and locals alike gather in the evenings in the main square, Jemaa El Fna, where the air is filled with the wonderful aromas from the stalls cooking up great feasts of Moroccan delights. Tagines, Kefta, Pastilla, Merguez and the traditional boiled sheep’s heads and brains!